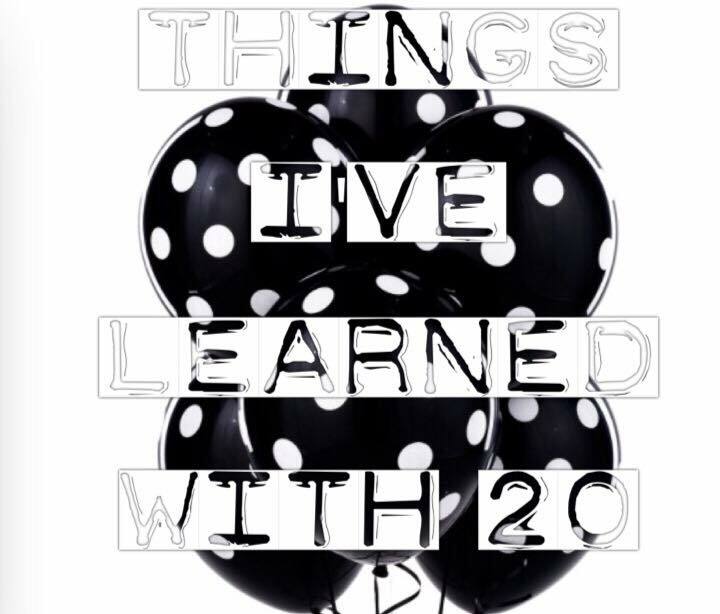 Let’s kick off the week with a collection of different lessons put in to sentences that I’ve learned with being 20 years old. Many of these sentences are essential and very important to remember from time to time. ♥ The people you don’t like probably don’t like you either. ♥ Treat other people the same way you want to be treated. ♥ Help out where you can. ♥ Don’t take to much responsibility and tasks on your shoulders if it is too much for you. ♥ Remember to think before you speak. ♥ It is okay to ask for help. ♥ You don’t have to be good at everything. ♥ It is okay to say no sometimes. ♥ You don’t have to be everything. ♥ Accept that some things you can’t change. ♥ Don’t disparage other people. They most likely have their reasons and not at least choice to do things they way they do it. ♥ You can’t compliment to little. ♥ Smiling will make you and people on your way happy. ♥ Don’t care to much about other people’s opinions. ♥ You can’t be friends with everybody. ♥ If you expect too much you will only be disappointed. ♥ Treat yourself and your body well. ♥ There is no reason to get offended easily. Most people don’t intend to offend you on purpose. ♥ Don’t take things personally. ♥ Your nails are prettier if you stop biting them. ♥ Having five extra minutes in the morning will only do you good. Five minutes extra sleep on the other hand wont make a difference. Stop snoozing. ♥ Don’t fast forward to apocalypse. Not everything has to go wrong. ♥ Stop comparing your life with other people’s lives. Be the moviestar of your own life. ♥ Learn to let go of stuff from the past. It will only weigh you down. ♥ Just because your exboyfriend cheated on you, doesn’t mean that your new one will. ♥ Being skinny won’t make you happy. ♥ No need to waste time on worrying. ♥ Don’t cry over spilled milk. ♥ Stop turning everything into a fight or an argument. It is not worth it. ♥ Be honest and don’t lie. ♥ You can’t get everything the way you want it. ♥ You can’t always get to choose and pick out what movie you and your friends/boyfriend are watching. ♥ Like your friend’s fan page for his band on Facebook when he invites you to do it. It will mean a lot when you need a like back one day. ♥ Stay in contact with old friends. ♥ Focus on the good stuff. ♥ Earn more money than you spend. ♥ Stop waiting for something better to come along. ♥ Live in the moment. ♥ In order to fly you have to fall. ♥ Failing is not the end of the world. ♥ You have time enough. ♥ Know your own boundaries and respect them. ♥ But on the other hand, it is good to leave your comfort zone from time to time. ♥ Work hard to create the life you dream to live. ♥ Always try new things. ♥ There is always room for improvement or a new skill to learn. ♥ If you really want something, you have to work for it. ♥ Your hair will look better if you remember to get a haircut every three months.